Three new RIC Issues Sheets are now available for download from our library. These briefing notes explain some of the key issues in the Ugandan roads sector, and explore some potential ways in which the country can address these issues most efficiently. RIC Issues Sheet 4 gives an overview of the challenges the roads industry faces, including the extent to which force account is used, and highlights the reasons why change is necessary. Issues Sheet 5 explains some of the policy action points required to create the competitive, private-sector driven roads industry that Uganda needs, and the need for a clear vision for the future structure of the road sector. And Issues Sheet 6 focusses on one important issue: briefcase contractors: ‘briefcase’ contractors – who bid for work (and win it) but do not have the necessary expertise to complete it. It outlines the need to improve registration of contractors to keep better control of those who work for GoU. 15/10/14: The Uganda’s Minister of State for Works (Hon. Eng. John Byabagambi) launched the new Roads Industry Council’s roads information Resource Centre this week at an event held at the Kampala Serena hotel. The Resource Centre is a new tool for finding important roads-related information. It gathers hundreds of reports, training materials and guides from different organisations and programmes, and presents them in an easy-to-access format. This makes previously difficult to access information on the development of Uganda’s roads directly available to anyone who needs it. Developed by the RIC in partnership with the CrossRoads programme, the Resource Centre allows users to research a wealth of important information. To help with this, the Centre categorises the hundreds of resources it contains into nine key areas of road development. This will allow users to quickly access information in their desired area. The Resource Centre also includes summaries for every resource – giving each user a brief overview so that they can decide whether they want to download a document for more details. All of these resources can be accessed via a website here >>>, Handbook here >>> and a CD (which is included with the hard copy Handbook). The Resource Centre provides a long-lasting legacy of easy-to-access information that others in the road development sector can adopt, adapt or develop as they see fit. 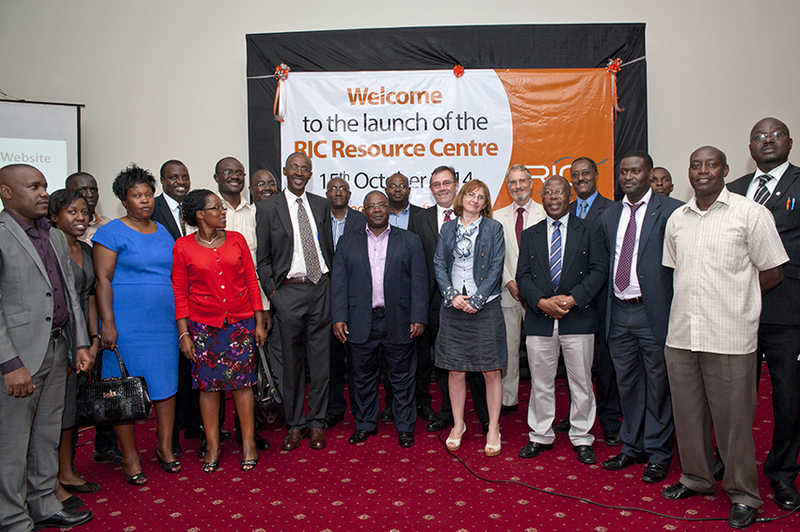 To find out more, visit the RIC Resource Centre website here >>>. 04/03/14: February was a busy month for Uganda’s Roads Industry Council. Here’s a quick update to let you know what’s been going on. Also in February, the RIC wrote letters on the issue of road maintenance funding to various government officials, including the Honourable Ministers of Works and Transport and Finance, and the Chairperson of the Parliamentary Physical Infrastructure Committee. This is a key activity in our influencing and advocacy work. To further help guide policy, a copy of Issue Sheet No. 2 was enclosed with each letter sent. Lastly, as result of a RIC Advocacy Meeting on ‘managing interim reliance on force account’, work is now underway on a policy brief to address the issues brought up. Expect to see this in April this year.